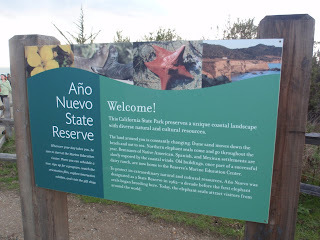 Going to the Año Nuevo State Reserve was absolutely the highlight of my trip last week to the Bay Area- so totally unexpected! On Wednesday when I went to visit the Marine Mammal Center in the Marin Headlands, I met an interesting gal in the gift shop who told me about the annual elephant seal event at Año Nuevo State Park. I had no idea how fascinating these creatures were until I was able to actually see them up close and personal - I wasn't even sure what an elephant seal was, except that they are HUGE! So on Thursday, I hopped in the car with my brown-bag lunch (pb and j + fuji apple), and headed south down Hwy 1 towards Santa Cruz. The reserve is south of Half Moon Bay on Hwy 1, but before Santa Cruz. This is one of my favorite drives - doesn't matter if it's rain or shine, I always find something to stop and look at. 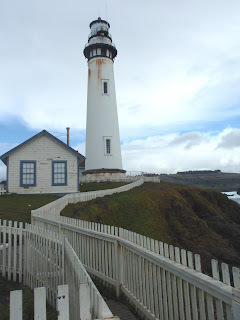 Pigeon Point Lighthouse was my first stop; a vintage, tumbling down lighthouse perched on a cliff surrounded by pounding waves. There's a cat-walk the runs in front of the lighthouse out across the rocks, a little rickety, be very careful if you decide to walk out to the edge. Priceless view of surf pouring in-between the rocks and pelicans dodging waves, playing in the wind! Not too much father down the road is the State Reserve at Ano Nuevo. 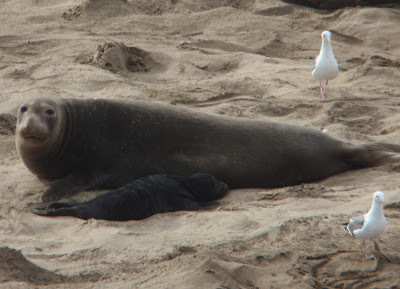 This reserve is set up to protect marine mammals and marine plants on the California Coast - and is possibly the largest breeding colony for elephant seals. 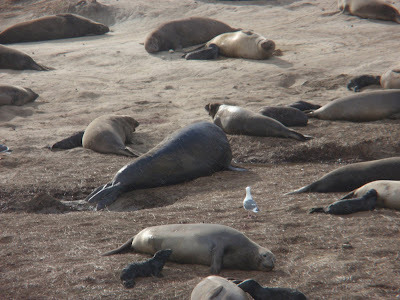 The breeding season begins in December and goes through March; we were told that at the height of the season there can be as many as 4000-6000 elephant seals on the beaches at the Reserve! 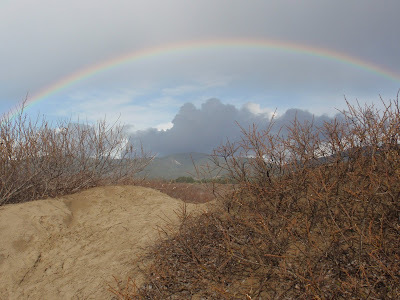 The only way to see the elephant seals is by guided volunteer tours down to the beach. If you do plan on visiting, I would recommend calling ahead of time to schedule your free tour - sometimes booked up for months in advance! (I just got lucky!) As the walk is over 3 miles round-trip, I would also recommend that you dress in layers, bring binoculars,a good camera, and wear good shoes. The walk is not difficult, you just might have to walk in mud puddles and sand. 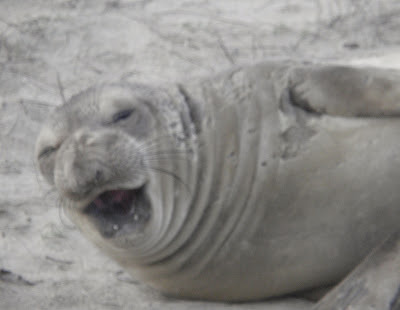 Male elephant seals can weigh as much a 4000 pounds - females around 1400 pounds, babies begin their life at 75 pounds, but will grow up to 600 pounds just in the first few months! The day that I was at the Reserve there were 1400 + females, 600 males and countless babies - more being born every minute. We actually got to see a few babies being born! Fascinating to learn about these incredible animals - although they are mammals, they can stay underwater for up to an hour, and migrate approximately 8000 miles per year! Breeding season is really the only time that they come ashore for any length of time, spending most of the year at sea . Elephant seals do not eat during this period of time, resulting in a weight loss for the males of up to 50% of their total body weight. Females group in "harems" with one large bull male protecting and impregnating them... wild to watch! Bull males fight over the females, most of the time the leader is able to scare off other males by simply making a lot of noise. Amazed at how fast they could move on the sand when they were challenged - also a good reminder that they really are wild animals, and can be dangerous. In December when the females begin arriving, they start having their pups almost as soon as they arrive on the beach, feeding them until March. Then the moms return to sea leaving the pups to fend for themselves. Nature seems sort of cruel, but the babies are weaned by that time, they somehow figure out how to start swimming and finding food for themselves. The males are the last to leave - hoping to impregnate every last female that they can. Isn't nature grand? This big male was enjoying a bit of sunshine and a nap! 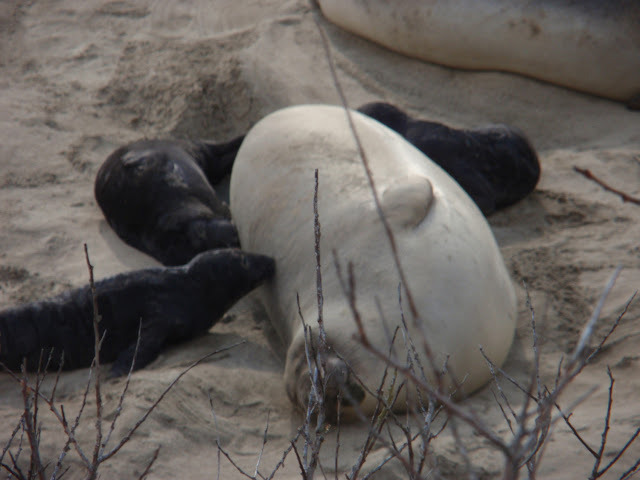 Our guide told us that these males that were laying back in the dunes were the "losers", the girl seals weren't interested... I thought he was kinda cute! Weaner pups back in the dunes - way too cute for words! 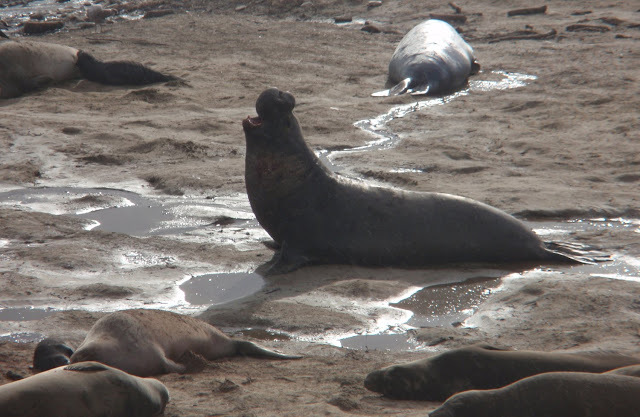 I am not the greatest video person on the planet, but at least you can get an idea of how many elephant seals were on the beach and how noisy they are! 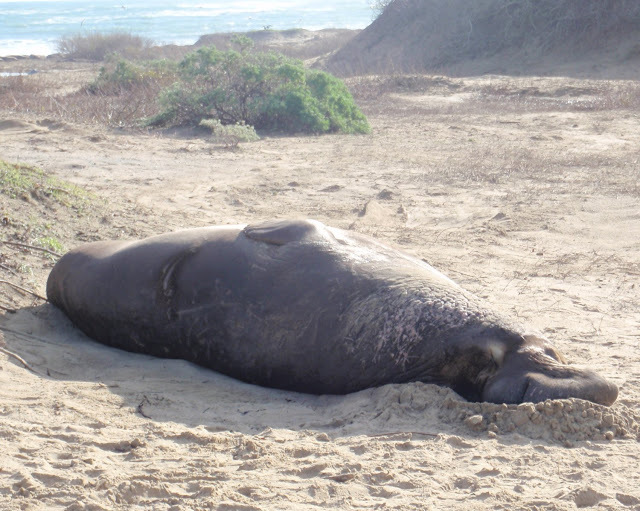 I really hope that you get a chance to experience this opportunity to walk among the elephant seals at Ano Nuevo. This is an incredible reminder of how precious the life in our seas is, and how little we really know about our oceans.